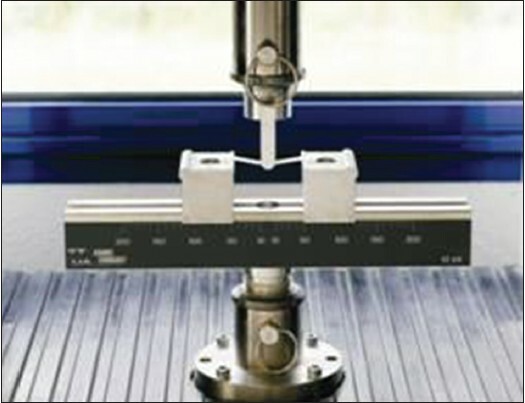 Objectives: This study was done to evaluate the flexural strength of carbon, quartz, and glass fiber posts by means of three-point bending test. Materials and Methods: Thirty pre-fabricated fiber posts were used and divided into three groups. Group I carbon fiber posts (C-Post), group II quartz fiber post (Aestheti Plus), group III glass fiber post (Para Post White) Ten posts (N = 10) were used for each experimental group and were measured with digital caliper before test accomplishment. The fracture load of post specimens was measured, and flexural strength was obtained by the formula using S = 8FL/pd 3 . The values in Kgf/mm 2 were obtained and calculated to Mpa and submitted to ANOVA (a = 0.01) and to the Tukey's test. Results: The mean values of flexural strength show that group II quartz fiber posts (666 MPa) are significantly higher than group I carbon fiber (614 MPa) and group III glass fiber (575 MPa). C onclusion: Hence, this study concluded that quartz fiber post showed significantly higher flexural strength values. Further scope of this study lies in the evaluation and evolution of a restorative materials used for post and core preparation, which have modulus of elasticity in harmony with that of dentin and near-natural esthetic appearance. Introduction: Surgical and non-surgical endodontic treatment of involved teeth can necessitate prescription of analgesics and antimicrobials. The literature suggests confusion amongst practitioners regarding the need for adjunctive medication, mainly during non-surgical endodontic treatment, often leading to over-prescription. 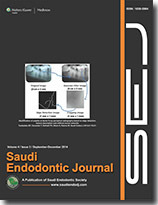 Aim: The aim of this study was to determine the current clinical practice of dentists participated in this study with respect to antibiotic and analgesic prescription patterns in their endodontic treatment management in Kuwait. 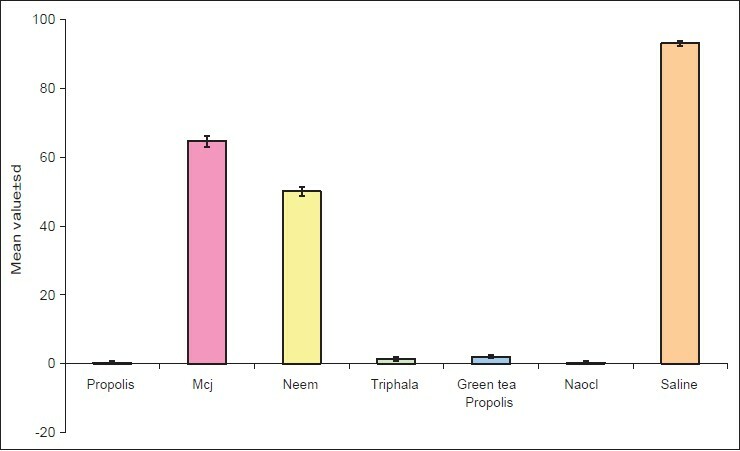 Materials and Methods: Prescription patterns for antibiotics and analgesics were analyzed based on the responses to self-administered questionnaire (n = 169). 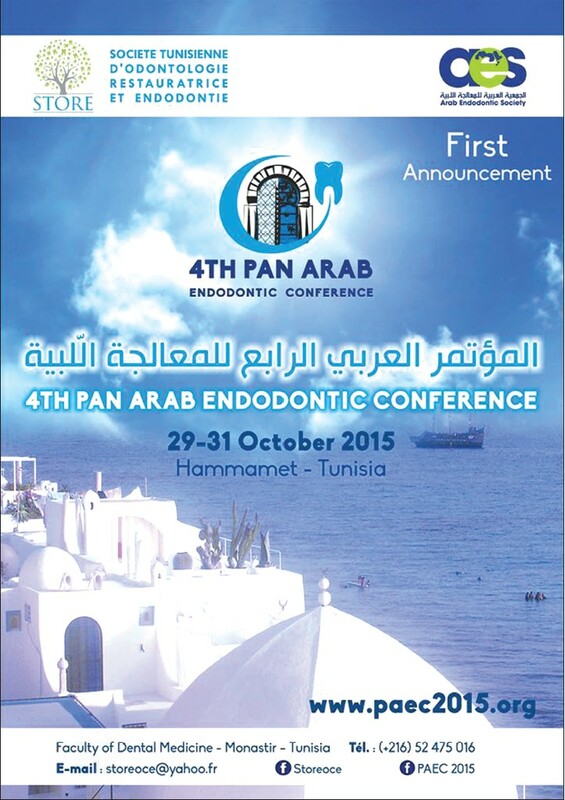 Information was collected based on different clinical endodontic diagnostic scenarios. Statistical analysis was performed with SPSS software version 17.0 to determine relationships between prescription patterns, age, gender, and dental qualification (specialists and general dentists). Results: Ninety-two percent of dentists prescribed analgesics for the management of endodontic pain. While 16% prescribed antibiotics for severe dental pain; 62% prescribed antibiotics for acute apical abscesses. Significantly more male dentists prescribed antibiotics for dental pain than female dentists. No significant difference was found between general dental practitioners' and specialists' attitude toward drug prescriptions. Amoxicillin and ibuprofen were the most commonly prescribed medications. Conclusion: While the majority of dentists appeared to prescribe antibiotics and analgesics appropriately, some did not. 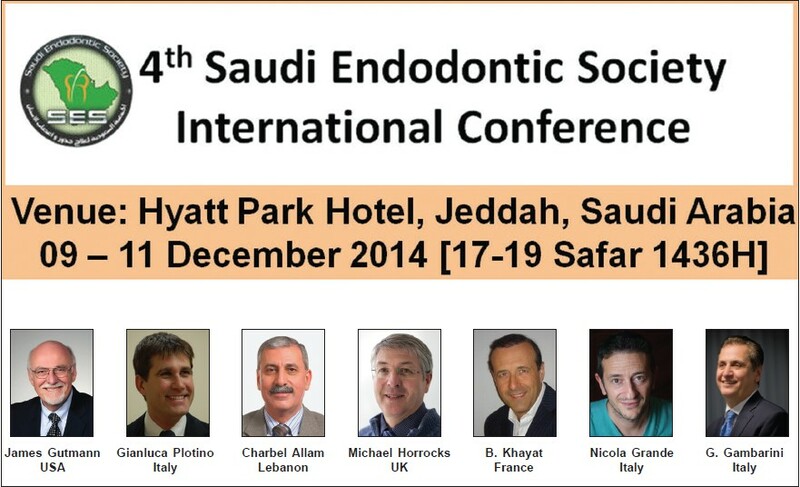 This research confirmed previous studies and established a need for imparting information of evidence-based prescriptions protocols for the dentists surveyed in this study in Kuwait. 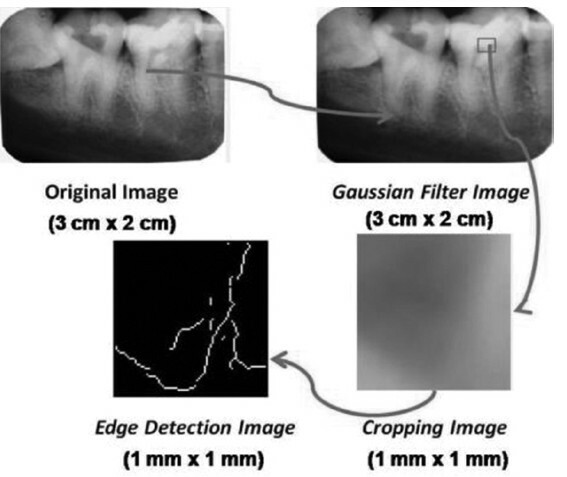 Aims and Objectives: To evaluate the effectiveness of mineral trioxide aggregate (MTA) when used as a pulp capping agent in permanent teeth with carious exposure (≤1mm) after root formation is completed. 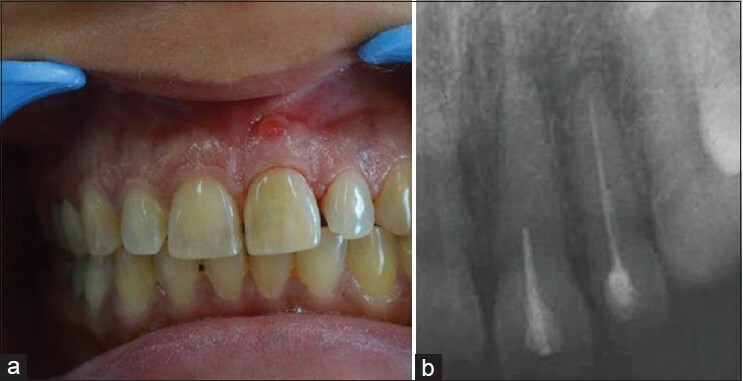 Materials and Methods: Clinical follow-up was performed on 32 mandibular molars with deep occlusal caries, in patients in the age group range of 18 to 42 years. Carious pulpal exposures were treated by direct pulp capping with MTA, followed by a base of light cure glass ionomer cement and restored with amalgam. Clinical and radiographic examinations were carried out periodically at 1, 3, 6, 9, 12, 18 and 24 months. Results: After 24 months clinical and radiographic follow-up, it was found that 25 (out of 32) patients had successful outcome. However, two patients failed to return for evaluation after permanent restoration, and five patients exhibited clinical failure. Conclusions: Mineral trioxide aggregate was found to be an effective material when used for direct pulp capping in permanent teeth. However, further investigations with a larger sample size are needed to support these findings. Iatrogenic root perforations, which may have serious implications, occur in approximately 2-12% of endodontically treated teeth. Successful management of root perforations is dependent on early diagnosis of the defect, location of the perforation, choice of treatment, materials used, host response, and the experience of the practitioner. 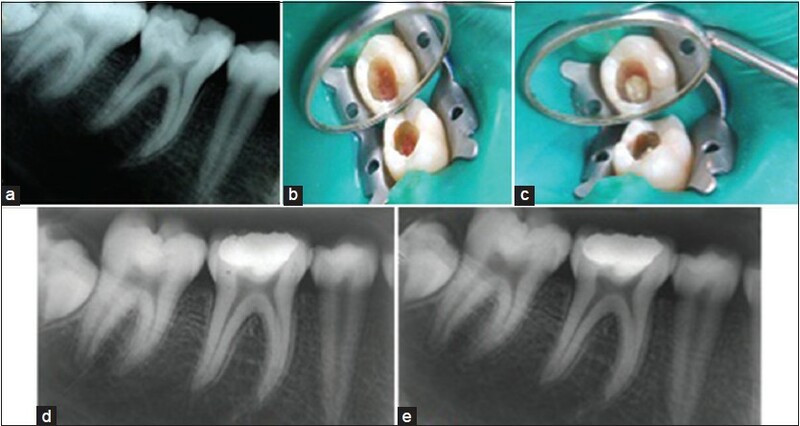 This report presents the successful management of an iatrogenic perforation in a tooth with radiographic evidence of pulp canal obliteration. A radicular cyst arises from epithelial remnants stimulated to proliferate by an inflammatory process originating from pulpal necrosis of a non-vital tooth. Radiographically, the classical description of the lesion is a round or oval, well-circumscribed radiolucent image involving the apex of the tooth. A radicular cyst is usually sterile unless it is secondarily infected. 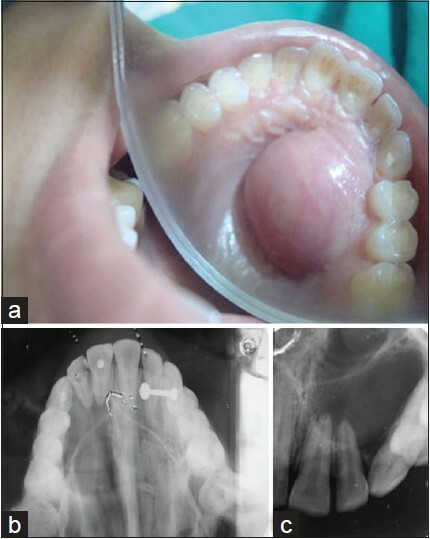 This paper presents a case report of conservative non-surgical management of a radicular cyst associated with permanent maxillary right central incisor, right lateral incisor and right canine in a 24-year-old female patient. Root canal treatment was done together with cystic aspiration of the lesion. 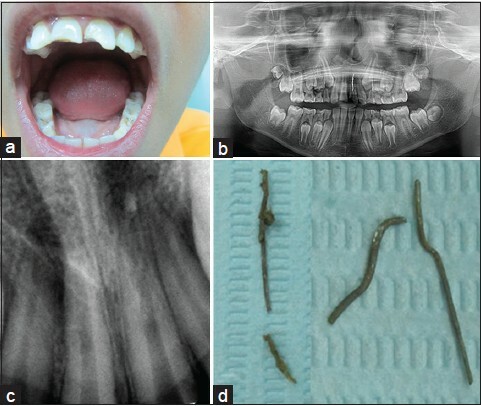 The lesion was periodically followed up and significant bone formation was seen at the periapical region of affected teeth and at the palate at about 9 months. Thus, nonsurgical healing of a large radicular cyst with palatal swelling provided favorable clinical and radiographic response. A thorough knowledge of root canal anatomy is essential for the endodontic therapy.Aberrations in the root canal system, especially in multirooted teeth, can pose a considerable challenge to the endodontist during root canal treatment. The dentist should be familiar with various root canal configurations and their variations for successful endodontic therapy. It is important to evaluate each individual case for variations.There are rare variations in root canal number and configuration in maxillary molars, which could affect treatment outcome. 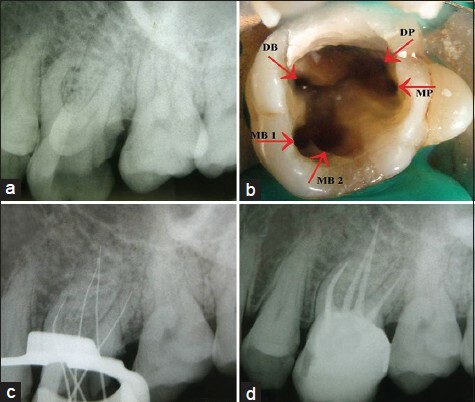 The present case report presents the endodontic management of a maxillary first molar with a variant root canal anatomy, having five root canals, with mesiobuccal root havingtwocanals (Vertucci type II), distobuccal root having onecanal and the palatal root having twocanals (Vertucci type II). The variant root canal anatomywas confirmed using a spiral computed tomography (SCT).With 3D reconstruction of the SCT image of the tooth, it was possible to scrutinize the patency of the canal lumens, throughout the entire length of the palatal root.This case report highlights the value of a SCT scan as a supplement to plain radiographs for the accurate diagnosis and successful endodontic management of a complex morphological variation in root canals.It also serves to remind the clinicians that such anatomic variations should be kept in mind during the endodontic treatment of maxillary first molars.